There are many methods and tools one can use to train a pet dog. Among them is a dog training collar, which discourages unwanted behaviors by emitting a vibration, noise or small shock. Our team performed extensive research into the many dog training collars on the market, gathering key insights into important features, such as size, range of operation and the technology involved. To learn more about dog training collars in general, check out our buying guide below that discusses these features. Read more about our methodology. 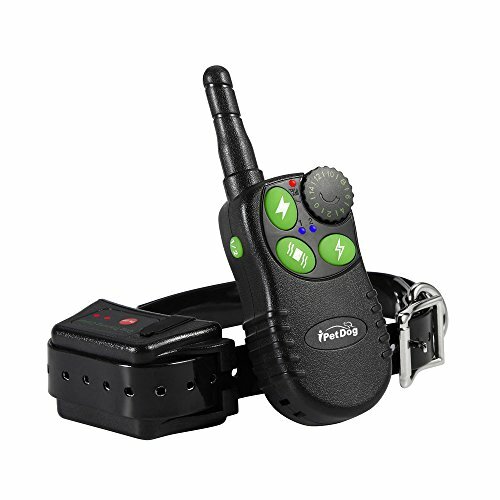 The FurryFido Dog Training Collar combines the full range of advanced remote training options with a top-notch operational range that we have not seen in most comparable collars. Additional consumer and dog-friendly features like a free training eBook make this collar stand out even more. The ColPet Dog Training Collar more than holds its own against more expensive products while being very friendly on the wallet. With great energy savings and a large range, the Colpet collar gives you everything you need to train your dog well, with a few extras to boot. The Aetertek 211D Dog Training Collar is targeted towards those with smaller dogs or puppies. It features a collar that is shorter in length but still adjustable within the set parameters. 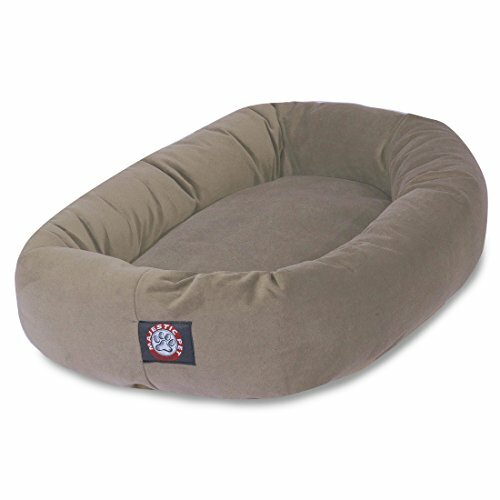 It also has tons of user options and other features that make it excellent for small dogs. The PetSpy M86-1 Dog Training Collar allows your dog the freedom to run and explore over long distances. Both owner and dog will be happy to have the safe opportunity to work in bigger areas. You won’t find many collars with a bigger range, and the product has a modest price as well. 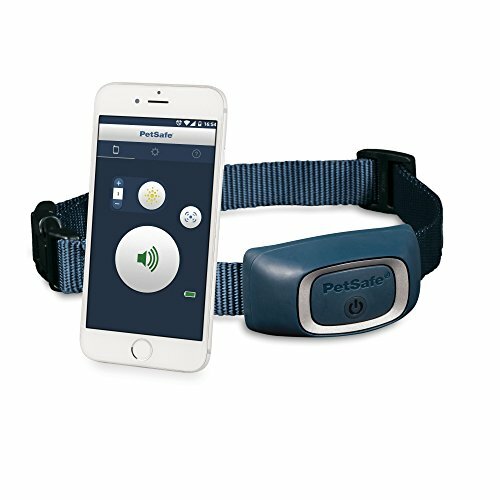 The PetSafe SMART DOG Bluetooth Training Collar uses bluetooth technology to allow the user full control through a smartphone and accompanying application. This unique control method pairs with 15 levels of correction for your convenience. Perhaps the most important consideration when purchasing a dog training collar is the size of that collar. You want to buy something that will fit your dog snugly in order to best take advantage of the collar’s features safely and productively. While many training collars boast an adjustable design to fit different dog dimensions, you can also find something more specifically targeted towards the size of your dog. If your dog is comfortable with the collar, it will in turn make you more comfortable about the training process. Will you be using your training collar in a small area of your home or in a huge backyard or other large space? There are a variety of operating ranges for the remotes on training collars, and you should factor in how much range you think you’ll need when making a purchasing decision. Although the lower range devices are often more than far enough for the average user, some people may need access to longer ranges depending on where and how they are training their dogs. Dog training collars often have many similar advanced features, including things like stimulation levels, different modes, rechargeable batteries, LCD screens, safety protections, sleep mode, and more. However, small differences in these technologies could make the difference in choosing a collar. Perhaps you want a training collar with more adjustment levels so you can fine tune your dog’s training, or a training collar that you can use with your phone. In any case, you will want to consider the totality of advanced options and technologies in relation to your specific needs when purchasing a training collar. Dog training collars tend to range from $30 to $100. You can find some collars that run upwards of $200, but these models tend to be most useful for professional dog trainers. For the average consumer, a high quality training collar that meets specific training needs can easily be found for around $50. Products with particular features like extended range may run a little above the average price, but overall still remain fairly modest. At whatever the price point, you can rest assured that most modern dog training collars will be of good quality with many advanced options. With a high-quality mix of the best there is to offer in the dog training space, the FurryFido Dog Training Collar is an exceptional choice for dog owners and their pets. 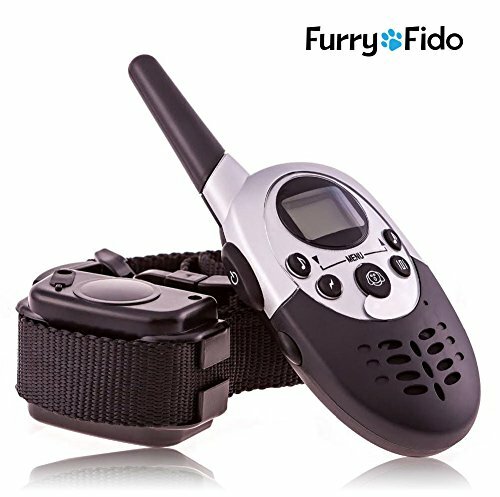 Featuring 8 different correction levels, rechargeable batteries, and energy-saving technology, the FurryFido collar separates itself from the pack even more for not sacrificing the collar’s astounding range and user friendliness, with features such as sound training for the disabled. Feature-rich with long range. The FurryFido collar possesses a great combination of features like rechargeable power, a waterproof design, adjustable one-size-fits-all collar, and sleep mode, without compromising range. 8 correction levels are more than most competing models, and operation of up to 1,000 yards stands towards the top in terms of range. Consumer and pet-friendly design decisions. FurryFido clearly endeavored to be as inclusive as possible in designing this collar. A sound training mode helps aid owners who are sight-disabled, and the collar has an auto-protect mode to make sure dogs stay protected at all times. Durable through wear-and-tear. Whether submersed in water up to 20 feet or subjected to the elements of mud, rain, and snow, this collar is built to last. Free eBook to complete the package. Training a dog to abandon an unwanted behavior can be difficult for a novice, as it requires verbal commands, visuals, and the stimulation of the collar. A free dog training eBook is included with this collar to help walk you through the process successfully, adding substantial value. May not need range. You might not be able to fully utilize or have need of the huge 1,000 yard range. Remote control difficulties. The remote has a few design quirks, as some users may find all the extra buttons confusing, which can result in accidentally hitting something that changes a setting or does another undesired action. When it comes to getting great value on a budget, it’s hard to beat the ColPet Dog Training Collar. 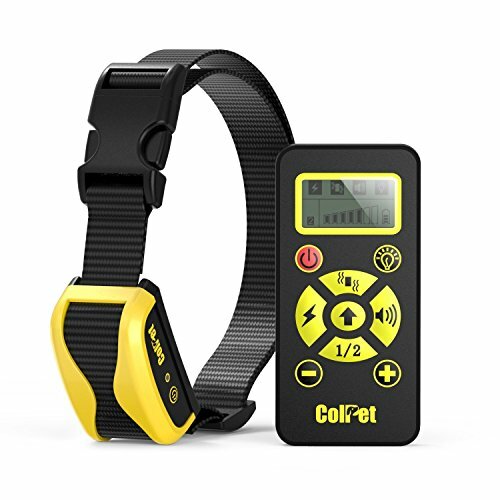 With all the characteristics you expect including rechargeable batteries, water resistance, an adjustable collar, and a remote range that stretches much farther than many pricier models, the ColPet Dog Training Collar is a steal at its price. There are even additional surprise features that enhance the ease-of-use and overall value. Fully-featured at a budget price. The ColPet collar does not skimp on any feature, and awes with the huge 800 yard range and four different modes (most models have three). Flashing light mode. The flashing light mode is an extra setting that is very useful for training in the dark of night, as you’ll always be able to keep your eyes fixed on your dog’s position by following the bright red light. Slim design makes things easy. A modern, slim design on the remote both looks aesthetically pleasing and helps you to accurately operate the device. The remote also has a clear LCD screen and is easy to carry around in your hand or pocket with its cellphone-like, antenna-less style. Quick sleep mode. The sleep mode activates after just a few idle minutes. If it goes into sleep mode it takes a second to regain control, which is something to consider with the quick reactions sometimes needed in training. Water-resistant but not waterproof. The collar certainly can withstand rain and brief exposure to water, but it is not designed to be submerged in water like some other dog training collars. Owners who are looking to train a puppy or small dog need to pay close attention to the fit of the training collar. While many training collars are adjustable, the excess length of a one-size-fits all collar may not be the right choice for your small dog or puppy. A training collar specifically designed for smaller breeds will ensure a comfortable, safe fit for your pet as you work to properly train and eliminate unwanted behaviors. Small dogs and puppies deserve particular attention—a more delicate, careful approach exemplified by the Aetertek 211D Dog Training Collar. Whether it’s the collar that fits a small dog more comfortably or the extra sensitivity settings for safe training, the Aetertek collar makes sure to tailor everything towards accommodating smaller sizes. This simply can’t be achieved by the one-size-fits-all collars on the market. 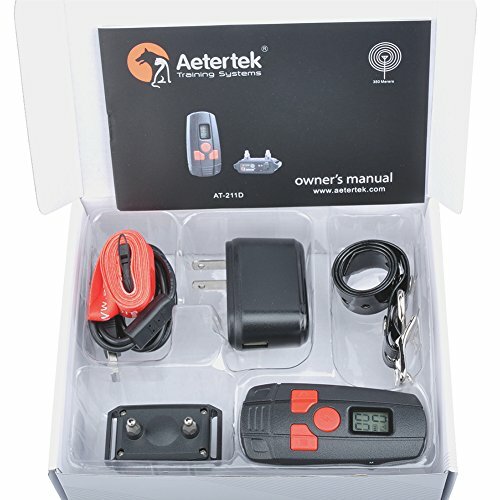 The Aetertek 211D Dog Training Collar also has the full range of user options to help you capably train your puppy. A collar specially-designed for your little pup. Small in size but durable. The adjustable 2-inch to 9-inch collar is perfect for smaller breeds, such as chihuahuas, and for young puppies, and it can withstand all of their playful shenanigans. 10 levels of correction. The extra stimulation settings help you locate the perfect arrangement for safely correcting your dog. You can start at low vibration settings and still have a lot of room to find the optimal level at which your dog responds. Charge both at once. The new cord allows you to charge both the collar and remote at the same time so you can cut out the down time and get back to training. Measure dog’s neck size. Even if your dog is on the smaller side, they might have a neck that is still too large for this collar. Lower range. While 330 yards is still plenty of distance, it is on the lower end of the scale when it comes to operating range. Remote is also on the smaller and lighter side. The remote is not the sturdiest, and it is small with small buttons. If you're training a medium- to large-sized dog, you want to make sure that the training collar has sufficient length to accommodate the animal's size while maintaining comfort. These collars are suitable for medium-sized dogs and can be adjusted to fit larger breeds, as well. When it comes to a longer collar that still maintains adaptability and control, the iTrainer Dog Training Collar succeeds far beyond comparable brands. Larger dogs can be more stubborn, but the iTrainer Dog Training Collar has the tools for the job, namely a whopping number of sensitivity settings that we haven’t observed in most other collars. You’ll surely find a setting that will help you and your dog achieve the benefits of training and guidance. Collar length. Length ranges from 7 inches all the way up to 25 inches. This is one collar that will fit even giant dog breeds, but one that can also be adjusted to work well with medium-sized dogs. Expansive correction settings. The 15 levels of correction seen in the iTrainer collar is well beyond comparable collars. You’ll have the flexibility to find the best working level for your medium, large, stubborn, or excitable dog. Short and long metal contacts. In order for the vibrations and other sensations to be felt by the dog, metal contacts on the collar must be touching the skin. The iTrainer dog collar comes with an extra pair of longer metal contacts in order to reach the skin of dogs with longer fur. Big buttons for ease of use. The included rechargeable remote is designed with big, bright green buttons that clearly delineate the action that each button performs. The adjustable correction settings are controlled through a practical scrolling wheel. Excess collar. IIf your dog is on the lower end of the size spectrum for this collar, you may be compelled to cut off the excess. Range can be an important factor when purchasing a dog training collar. For dogs who roam large areas or big open spaces, a longer operating range will help you maintain safe control over your dog. Furthermore, range is often significant in an emergency situation. If your dog bolts toward someone or something, you’ll want to be confident your device will work at a long distance. The longest range dog training collars can function at distances of over 1,000 yards. Ever wanted to experience the pure joy of freely exploring the great outdoors with man’s best friend? Doing so requires safe and appropriate training, oftentimes at longer distances. For this, the PetSpy M86-1 Dog Training Collar is equipped for the task with its immense 1,100 yard operational range and fully-featured training options. Such a huge range will give you peace of mind as you train your dog to eliminate any number of unwelcome behaviors or to recognize where the extent of his boundaries rests. Among the farthest ranges available commercially. The 1,100 yard operational range is the real selling point here, and it really is a massive distance. You can train your dog in a huge dog park, forest trail, or any wide-open outdoor space without fearing any loss of operational control over the collar. If ever your dog runs off and gets really far away, you know you have a device that can react to and handle it. Durable and sturdy collar design. The collar is built to last. It is fully adjustable to fit even the biggest of dogs (up to 140 pounds), but still fits smaller dogs. Free guide and training videos included. To get you off to a good start, the PetSpy collar comes with important training guides and videos to apply as you work diligently with your dog. Be careful when charging. If you overcharge the remote and collar, the product’s battery life can decrease steadily over a period of time. Collar can be cumbersome. The bulk that allows it to be sturdy conversely can be a little unwieldy and might appear a bit uncomfortable for your dog if worn for a long period of time. In general, dogs should not wear any dog training collar for too long at a time. Dog training collars are no exception to new technological innovations in consumer products. There are now training collars that can be completely controlled through bluetooth and smartphones. This represents a convenient way for owners to go about training their dogs, where everything needed can be achieved through a simple smartphone app. Lately, it seems like ‘smart’ technologies are expanding into products we wouldn’t expect. Certainly, a dog collar you control with a smartphone is not something you see every day, but the PetSafe SMART DOG Bluetooth Training Collar pulls it off by keeping things relatively simple despite the advanced technology. Download an app, put the collar on, and start playing around with the easy-to-use app interface and 15 different correction levels. While there are stricter limits on the range of this collar, controlling everything through your phone can open up new possibilities to connect with your furry friend. Smartphone and free app control. The app is free to download in order to get started training through your smartphone. Easy to use. The setup is easier than collars that use a remote, and everything you can do is available on the interface with a tap of your screen. There’s no need to carry around a burdensome remote when you can just use your own phone. Multiple authorized users allowed. With your authorization, other family members or even a pet sitter can use their phones to train your dog. Multiple users give you more opportunities to train in different ways. The app is required. There is no other way to control the collar other than through the app, which does require an operating system of either iOS 5 or later or Android 4.3 or later. Limited range. As the collar relies on bluetooth technology, there is a limited range for operation. Still, a range of 75 yards is fine for a house or small backyard, though some users reported even shorter ranges than described.